Nothing can be achieved without putting the hard work in before hand. Hence a hectic training schedule since the start of January as I prepare for the London Triathlon on Sunday August 2. 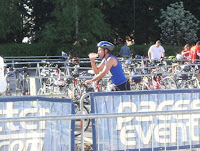 But last week, I went completely against every rule in the book prior to my second Sprint Triathlon at Lincoln. A two-day trip to Spain ended in, well, two days of drinking. And drinking too much. Don’t get me wrong, it was a right good laugh in the sunshine of Murcia. But as far as preparations go for a gruelling race, spending last Wednesday and T hursday drinking lager, red wine and whatever else was put in front of me did not help. Getting up at 6am to arrive at Burton Waters for my 8.26am start time was just another hurdle after a few days of little shut eye. But despite the partying in Spain, I quietly surprised myself in Lincoln. A potential problem with the pool led to the swimming leg being abandoned so it was turned into a duathlon. 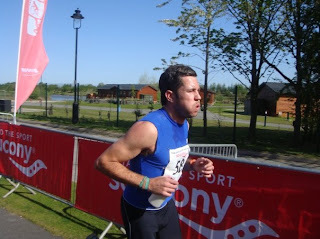 A 2.5k run, 24k on the bike and a 5k run to finish (Feeling the pain in Lincoln, see top right and middle). And in glorious spring sunshine, I completed it in 1 hour, 22 minutes. And without being sick, even more of a bonus. Maybe the partying in Spain in the sun helped my preparation - it got me used to the heat we experienced on Sunday morning. But while my split times for the run were up there with some of the top 30 finishers, it is my bike time of 53 plus minutes that hindered me. My town and trail bike is not like the road racing bikes used by most (bottom right). So that hinders me a little. But with the bike making 40k up of the London race, I plan to get out on the road in the next few months and get some serious miles under my belt. That will help. But I am sure during the early, steep hill in Lincoln that almost brought me to a standstill, I would have been better off had I not drank beer last week and had plenty of water and some early nights instead. It is easy to blame the bike!! So come the week before London, anybody who sees me with a beer in my hand has my permission to take it off me and drink it themselves. But while I surprised myself and blew off some cobwebs in Lincoln, I am sure I could have gone a little quicker. Like I said it is all in the preparation - and a 48-hour drink bender in Spain, no matter how enjoyable, is hardly the perfect build up to a big race.